Although not quite as traditionally 'Murican as chicken soup or chicken pot pie, these chicken spring rolls are new to TJ's and review-worthy, so let's take a brief look, shall we? The flour wrapper comes out nice and crispy when cooked according to the instructions. And I did. Aren't you proud of me that I didn't try to use the microwave? The filling is a nice soft blend of chicken, cabbage, and seasonings, with a detectable amount of sweetness, too. 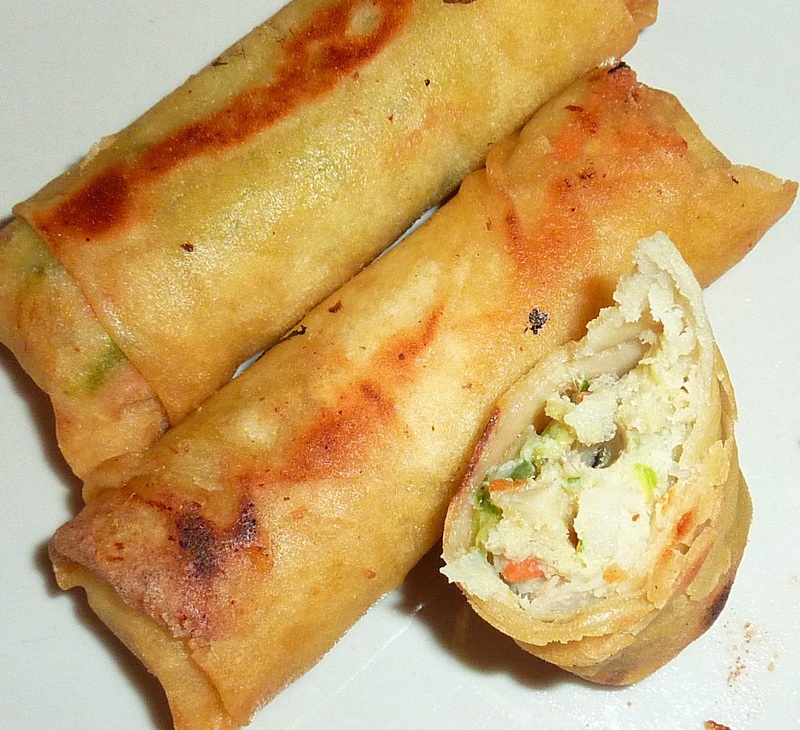 I've had spring rolls and egg rolls before, and I've never noticed anything sweet in the appetizer itself—perhaps in a paired dipping sauce, but not in the roll. Perusing the ingredients, I noted "sugar" right there in between green onion and basil. Interesting. Don't get me wrong, it's not excessively sweet by any means. Overall, the flavor is savory, salty, and somewhat successful, in my opinion. Also, wouldn't these be egg rolls? 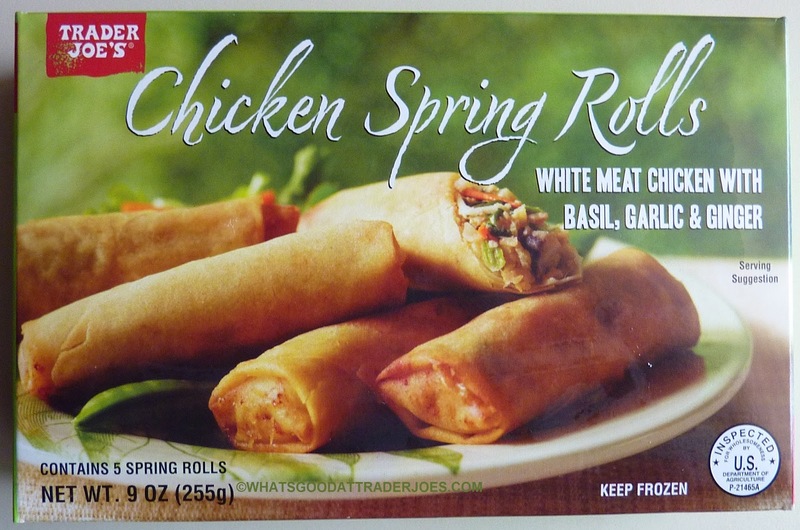 After a brief Google research session, the main qualifications I found for something to be a spring roll were "not (usually) fried," "with no chicken or meat," and "with a thin translucent or transparent rice wrapper," none of which apply to these happy little snacks. And before someone scolds me for not knowing that all spring rolls have sugar in them or the reason why these are spring rolls and not egg rolls, let me remind you that I'm the dude that just asked you to praise me for using the stove top instead of the microwave a couple paragraphs ago. I'm not exactly a gourmet cooking authority. But if you want my opinion on these rolls, I say they're teetering on the brink of "not bad" and "really darn good." Three and a half stars from me. Four stars from Sonia will push this in the direction of "really darn good." Her only complaint is that they don't come with a dipping sauce. 'Overall, the flavor is savory, salty, and somewhat successful, in my opinion.' Your adjectives are getting more descriptive!.. haven't seen these-- I agree w/ Sonja- they need dipping sauce... btw did u know they discontinued the sweet & sour mustard?? I was talking to a couple of employees at ti's and they're upset as well. Lol have my adjectives been vague in the past? Yes, some sweet and sour mustard would have gone well with these. It's good with the sweet chili sauce! I really liked these as well. Ditto on the dipping sauce, though! I loved these, although I didn't have them with a dipping sauce. The texture and flavor are both excellent. I'll definitely try them with the Sweet Chili Sauce next time. Ok , so I really went out of my way to make this meal taste good. And it actually tasted delicious,it all comes down to how you prepare it. So the box wasnt to helpful because I microwaved it for 30 seconds 3 times taking it out and flipping them, I preheated my toaster oven, when i put them into the T.O they were still cold but not frozen. I left it cook for about 20-25 minutes, I flipped them to make sure they cooked evenly. I also made a sauce out of cilantro infused with haberneros ,lime, garlic , onion powder , small bit of ranch just enough to make the sauce lighten up a bit (avocado/original mayo would have been better) and a little EVOO, Salt, siracha, and chilli flakes. I let the sauce sit out and i allowed the spring rolls to sit for 6 minutes after taking it out. Its all how you prepare these frozen dishes to get the best out of them. I also used alittle honey in the sauce.